From the Baldwin County Courthouse, follow Hwy 24 (Sandersville Hwy) east for 9.8 miles. 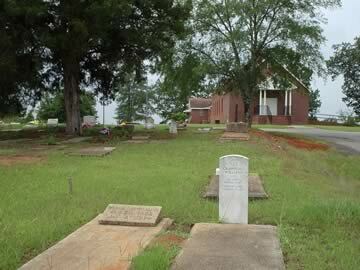 The church will be on your right and the cemetery is in the front of the church. Let our Father's will be done. only one date on gravestone. A circle symbol on stone. In loving memory of our mother and grandmother. Age 54 written on slab. Death date from cross above slab. no dates. First name spelled Margart. Written as Amarion Strange with J. underneath. New grave. Buried July 9, 2005. Date of death buried in ground. A loving wife, mother and grandmother. The Lord is my shepherd I shall not want. Years hard to read. Writing deteriorating.